The entrance to the new Comcast Technology Center in Center City Philadelphia. Comcast Corp. opened the doors to its new high-rise in Center City on Thursday, and it smelled just like a new car. Calling it a "sneak peek," chief executive Brian Roberts gave the first tour of the $1.5 billion Comcast Technology Center, taking the whisking Swiss-designed elevators to several floors of the city's tallest building, pointing out the commissioned art with Philadelphia ties adorning the walls, standing desks for employees, local chef Greg Vernick's coffee bar in the public lobby (not open to the public yet), and a 200-foot herb green wall along glass windows in the two-story company cafeteria with seating for 900. 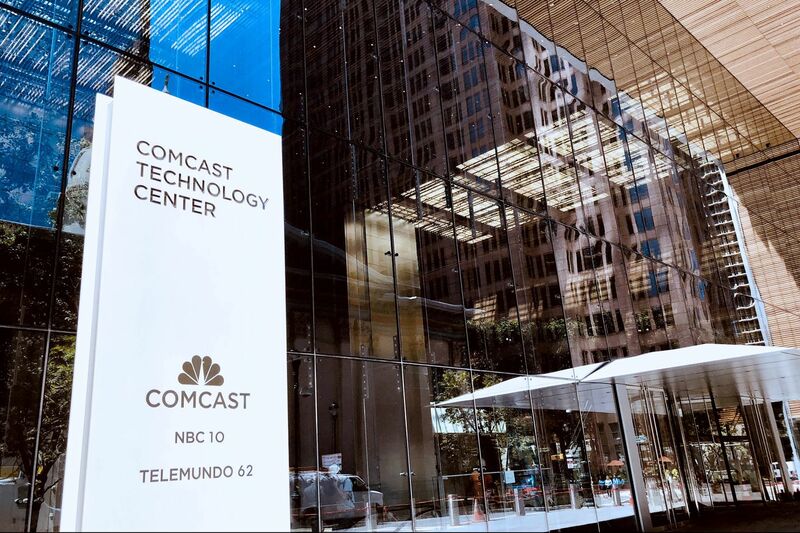 "A lot of the heart and soul [of Comcast] is in this building, in this town," said Roberts, who was trailed by a dozen local reporters and Comcast executives for an hour. "No one has tried to build a technology center in the heart of an East Coast city," he added. The lobby of the new Comcast Technology Center in Center City Philadelphia. Roberts, who will own an apartment in the 60-story building, mused about legendary director Stephen Spielberg or Microsoft founder and billionaire Bill Gates staying in the Four Seasons hotel that will top the new tower. Roberts has said that his vision is to create an urban campus that could rival those in Silicon Valley, with no offices and an "open-floor plan." The Comcast Center and the Comcast Technology Center will be connected by an underground concourse that's not yet open. Eight thousand people will work in the two buildings, and the amenities will include several restaurants, two company cafeterias, a full-floor gym (44th floor in the new building), on-site medical services, and the hotel that will open next year. Some have compared it to Rockefeller Center in New York. Though still under construction, Comcast has been relocating employees to the new building. The 1,000th employee will take up a desk there on Monday, and all 4,000 should be there by late December, Comcast officials said. Photographers weren't allowed to take photos on Thursday because of unfinished areas. Comcast announced the construction of the new tower in January 2014, after it had been discussed for at least a year. Comcast held a competition of international architects for the right to design it, won by Norman Foster of the United Kingdom who also designed Apple Inc.'s new headquarters in Silicon Valley. At the time, Comcast agreed to add 1,500 jobs in the city, bringing its Philadelphia payroll to about 6,300 employees. Comcast executives cautioned that this was a conservative estimate. Indeed, the company now employs 8,000 to 9,000 in the city. In addition to the Comcast Center and the Comcast Technology Center, the company leases floors in three other downtown buildings: One Logan Square, Two Logan Square, and 1500 Market St.
"Before you ask, I am not planning on building another building," Roberts said. Philadelphia skyline with the new Comcast Technology Center in Center City, Philadelphia.